Learning grids, also known as questioning grids, are brilliant! After experimenting with the resource I felt inspired to create learning grids that I could use with my classes. 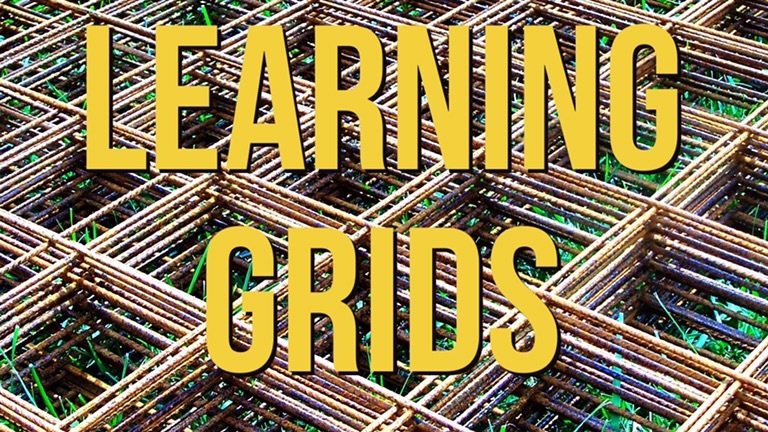 Learning grids appeal to students because they’re an enjoyable learning activity. The learning grids can be adapted for any subject and different key stages. Learning grids require a class set of dice. 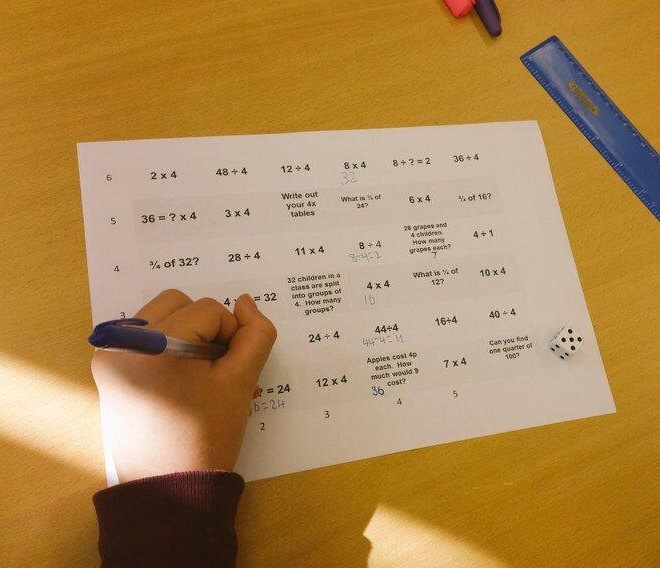 Students will roll the dice twice – to give them a number they can use for the horizontal and vertical line (for example 2 across and 4 down). I created a vocabulary learning grid where students roll the dice to get their two numbers. Those two numbers will lead students to a square where there is a letter of the alphabet. Using that letter of the alphabet they have to come up with a key word connected to the topic or learning outcome. 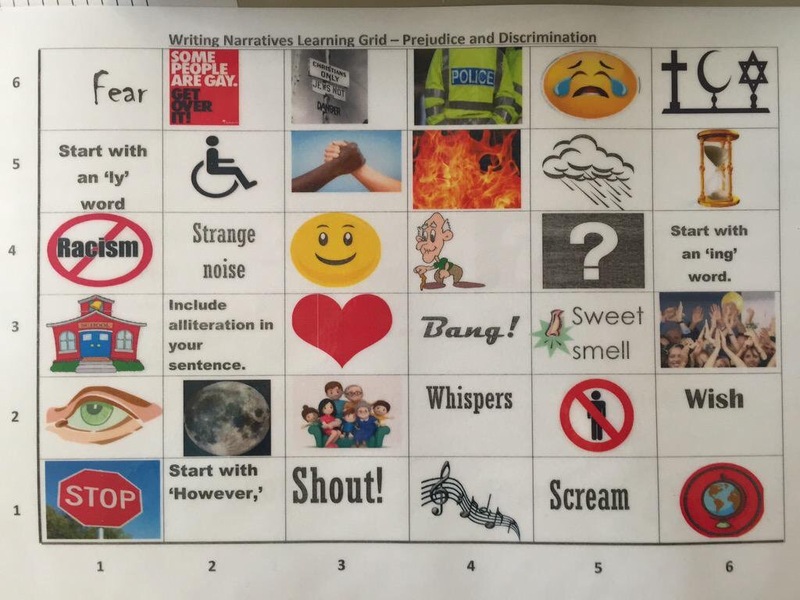 I have also used the learning grid as a way to help students write a narrative for a creative piece of writing, again linked to our topic. This example is from RE, where students have been studying a unit based on prejudice and discrimination. Every time they land on an image, they have to write a sentence connected to that image. Then on their next roll they do the same but try to link the new image with their previous sentence so the story flows. For example; the first image could be the moon so the story could begin on a dark night, the next image could be a police officer so the story could carry on … ‘I was woken up in the middle of the night to a siren of a police car’….what happens next would depend on what numbers the students roll with the dice and what image they have. This activity worked with my classes because students responded very well and were very creative. This activity can easily be differentiated too, as some students will need further support and structure. 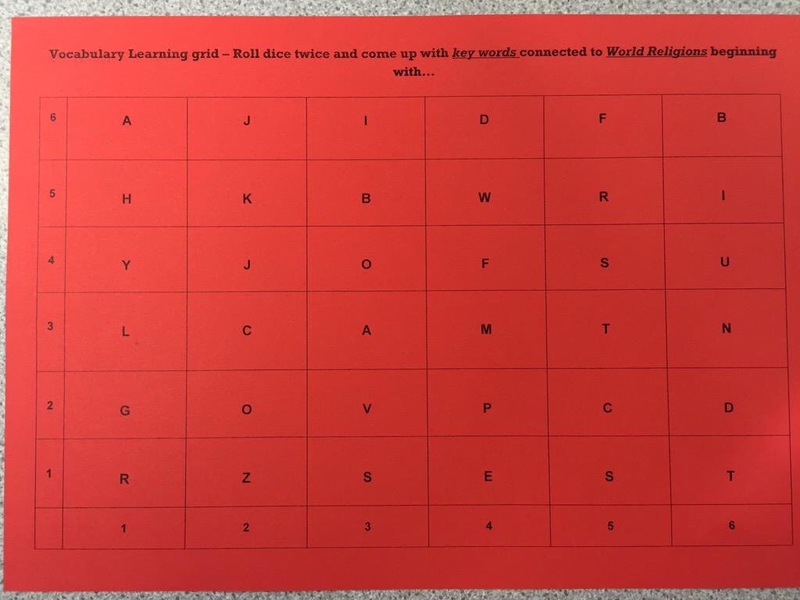 A colleague at my school created a learning grid with maths questions, showing this activity can be used in any subject! I have also created linking learning grids. 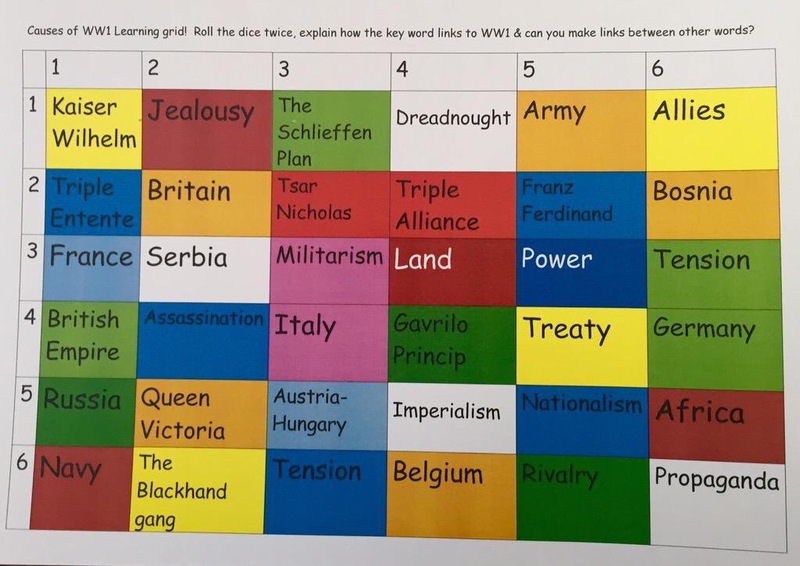 A linking grid I made for a History lesson had 36 boxes all connected to WW1. Students roll the dice twice to land on a box. They then had to explain the connection between that key word to WW1. Then they would do the same again, roll two numbers to land on another box but then with that word they had to link it to the previous word. For example, if the first box they landed on was Kaiser Wilhelm, a student would say he was the leader of Germany in 1914 when war broke out. Then after rolling the dice twice and having a new key word they would link that word back to the Kaiser, if they can, as some links are simple but others more of a challenge. So if the second was ‘militarism’ then that links to Kaiser Wilhelm because he was involved in an arms race that eventually led to WW1. It can be complicated to explain to students but I modelled the game and did two examples for them and then they quickly grasped it and made some excellent connections and links between factors. 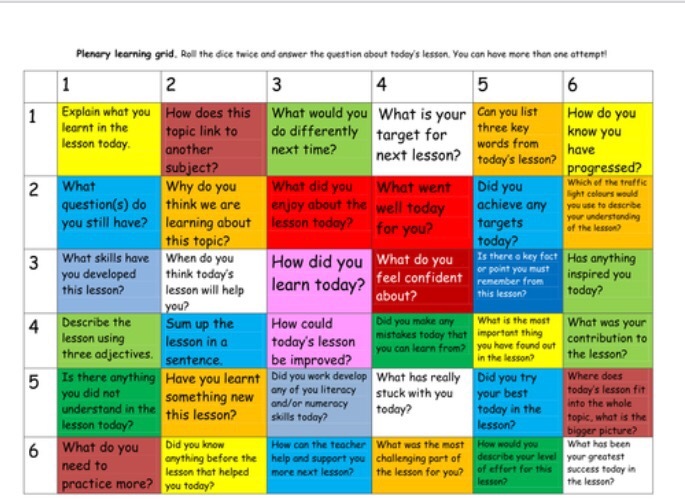 Plenary questioning grid. This idea was inspired by a plenary grid that I came across on Amjad Ali’s teaching toolkit, made by Tom Brush. The resource by Tom had lots of different types of plenary tasks to reflect on the lesson such as ‘Use play doh to illustrate key words’ and ‘Create a mind map to show your learning’. 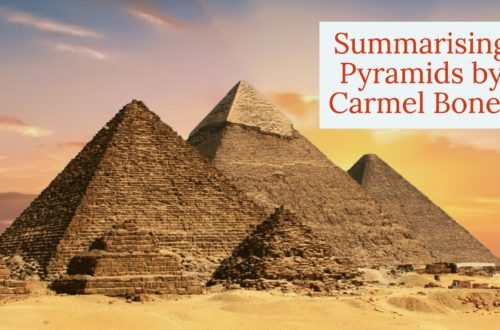 These ideas are really creative and fun but I found it can be difficult having so many different activities all going on at once at the end of the lesson. I adapted the grid so that it was purely focused on discussion, either in pairs, groups or as a class. Students roll the dice to get their two numbers then have to answer the question they land on, reflecting on the lesson. This is really simple once students grasp the concept and understand how the grids work. 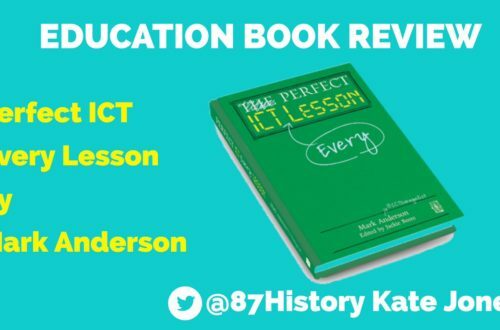 This has been a popular plenary with my students and I think it is very effective because it led to excellent self assessment and reflections from learners. The vocabulary and plenary grids can be downloaded for free from my TES page here. Thanks for taking the time to read my post. 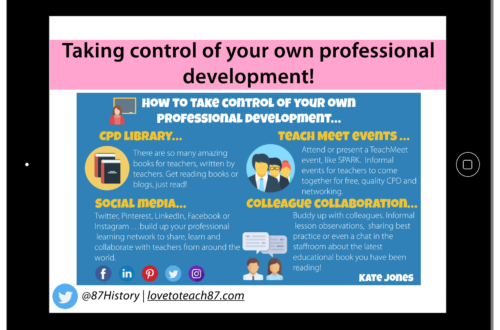 If you’ve been inspired by any of these ideas I’d love to hear from you to find out how you’ve taken them / adapted or remixed them and used them in your classroom. Please feel free to follow my blog and leave comments below or why not just drop me a message on Twitter . Next post Classroom displays for engagement and learning!